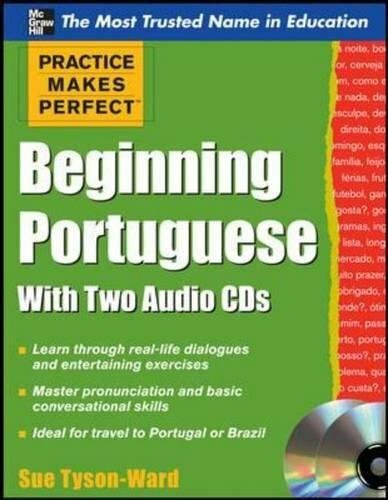 Consisting of 60 compact units, each lesson in Practice Makes Perfect: Beginning Portuguese with Two Audio CDs can be completed in just 20 minutes. Rather than focusing on grammar, each accessible lesson includes essential vocabulary, an easy-to-follow dialogue, an engaging exercise for you to practice what you've learned, a section on common phrases, and an interesting cultural comment. This approach allows you to master the basics of Portuguese communication without being intimidated by grammar. Each dialogue is given in Portuguese and voiced by native speakers. Every new word or phrase for the dialogues is given in the vocabulary section, and each dialogue appears on an audio recording, giving you the opportunity to hear correct pronunciation and develop your own speaking skills.